I am going to be doing an artist residency at LEGROOM space in Manchester, which I am calling ‘Listening to Architecture’. The public event programme features collaborations with dancers Hannah Buckley and Tora Hed as well as musicians from the Royal Northern College of Music, and work by composer and technologist Stuart Mellor. During this residency, I will create a range of situations in which the Legroom space and other locations around Manchester are actively listened to by audiences. 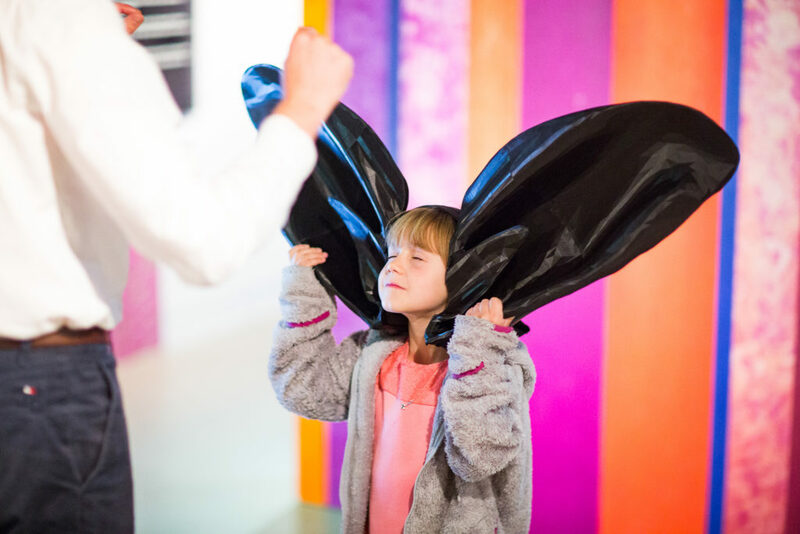 A range of workshops and pieces use the language of the physical properties of sound to frame (and reframe) space through performative games whose instructions are always determined by listening to the acoustic response(s) of the space. Through this practice, listening becomes the method through which audiences and participants begin to know and engage with, space. Pieces and workshops variously explore different types of movement and sound-creation in relation to this endeavour. The works in this residency use two broad approaches to ‘framing’ space. First, space as frequency, and second, space as time. The first approach aims to create understandings of spaces through exciting and listening to their resonant frequencies. The second creates understandings of spaces through making sounds and listening to resulting temporal responses – echo, reverb, reflection. 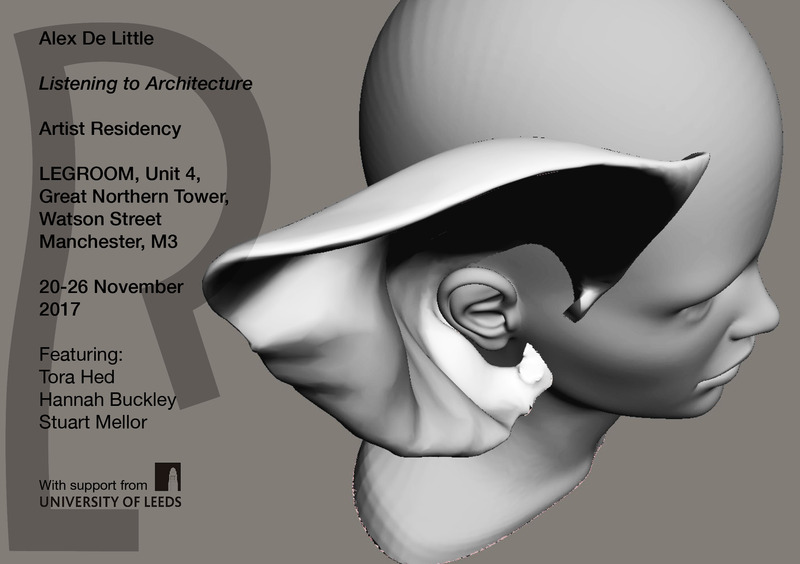 This residency is made possible with in-kind support from LEGROOM and the University of Leeds. LEGROOM is a Franco-British project space based in Manchester city centre, exploring the potential of movement and live art through artist-led events. LEGROOM is a platform for the development of interdisciplinary visual arts and movement projects with local and international artists, curatorial projects and organisations, expanding the frameworks for spatially and physically engaged works in Manchester. LEGROOM is supported by Castlefield Gallery New Art Spaces. Castlefield Gallery is a National Portfolio Organisation of Arts Council England. 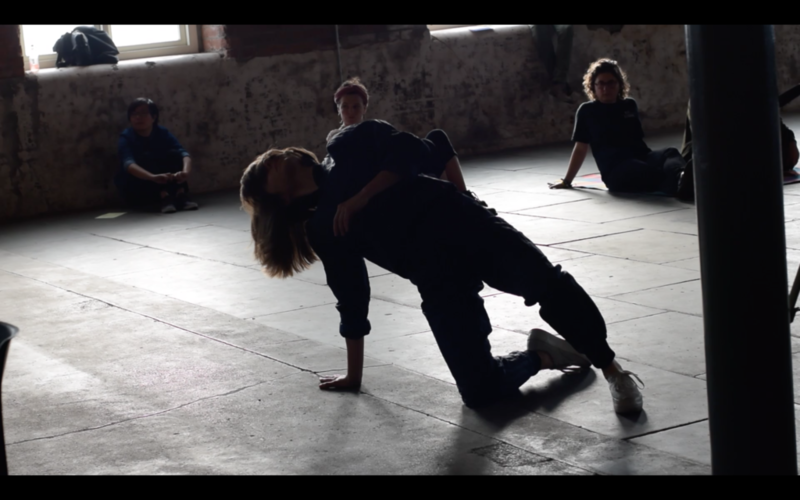 In collaboration with dancers Tora Hed and Hannah Buckley, the first event in the Listening to Architecture series explores the resonant frequencies of the Legroom space through tactility and movement. with Alex De Little, Hannah Buckley and Tora Hed. Every building has its own harmonic language; resonant frequencies are frequencies whose wavelengths directly match the size and shape of a given acoustic space. They energetically reinforce themselves and perceived as significantly louder than a non-resonant frequency. When resonant frequencies are played into a space, they create interference patterns or, a topology of areas of high and low sound pressure -resonant topologies. In this piece, dancers Hannah Buckely and Torah Hed improvise around these topologies, creating choreographies in direct response to them. Every movement corresponds to the physical distribution of sound in the space, which is a direct product of the architecture. The dancers’ improvisations, then, are a direct response to the architecture which is gained only through listening. Spatial Drone is a synthesizer improvisation which excites the resonant frequencies of the Legroom space. This is an improvisation which aims to subject a stationary audience to a range of body-listening experiences by putting the room into contrasting resonant vibratory states. During this experience, the audience becomes explicitly bound to the space through vibration. The audience both hears and feels the materiality of the space. The workshop is based on a series of text scores by Alex De Little, which place human subjects in feedback loops with acoustic space through emitting sounds and listening. The first part of the workshop engages participants in a listening-led exploration of outdoor locations in central manchester, by conceiving of humans as bat-like echolocators. 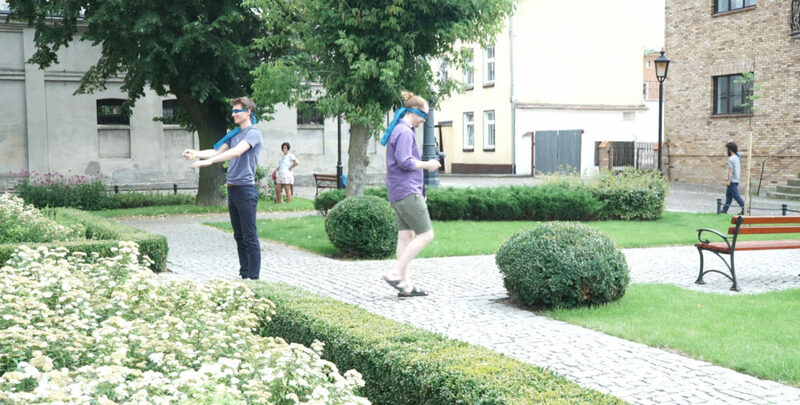 Armed with woodblocks and drumsticks, the participants are blindfolded and guided in several games which connect human subjects to the architectural layout of the site, as well as each other, through emitting sounds and listening to the space’s response. In these games everybody is a listener, but each listener is also participant, performer and audience member. In the second half of the workshop, participants are invited to understand a space through listening, by using their voice as a tool to test its acoustic responses. This is based on the three part text score, For Somebody That has Never Performed a Resonance. The first part of the score describes a method for using the human voice to detect the resonant modes of a space. The second invites the singers to ‘learn’ and ‘embody’ the resonances of the space by practicing singing them and finding their thresholds. The final section invites participants to evoke the pace through a collective vocal improvisation which used the embodied knowledge produced in the first two parts. // 12-1.30PM// For somebody who has never performed a resonance – participatory workshop which explores using singing to make architecture ‘speak’. Open to all abilities. venue: secret location, meet at LEGROOM. ​Free/donations welcome. venue: LEGROOM – Free/donations welcome. Local percussionists perform a series of text scores which set up systems of contingency based on the sonic reflections produced when sounds are emitted. The text scores are goal-based, and work by creating a feedback loop between movement, listening and sound emission. Spatial Drone is a synthesizer and Tuba improvisation which excites the resonant frequencies of the Legroom space. This is an improvisation which aims to subject a stationary audience to a range of body-listening experiences by putting the room into a range of contrasting resonant vibratory states. During this experience, the audience becomes explicitly bound to the space through vibration. The audience both hears and feels the materiality of the space.